MEO CFO Debbie Lorenzo, HFN Maui Petroleum General Manager, Steve Wetter, MEO BDC Director, Craig Swift, HFN Maui Petroleum President, Kimo Haynes, MEO CEO, Lyn McNeff, MEO Community Services Director, Gerry Lum, MEO Transportation Director, Harry Johnson, and HFN Maui Petroleum Marketing Representative, Laura Alfonso. 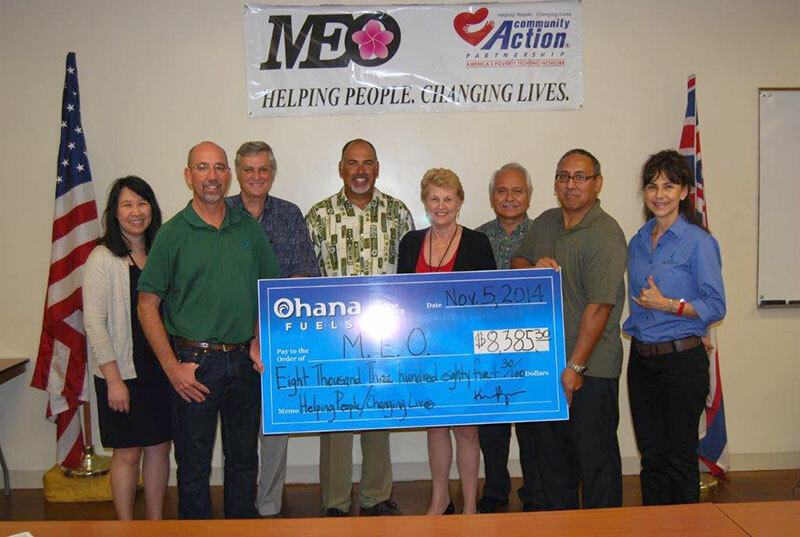 WAILUKU, MAUI (Hawaii) – Maui Economic Opportunity, Inc. (MEO) received $8,385.30 from HFN Maui Petroleum, Ohana Fuels, “Fuel Up. Do Good.” community giving program. Ohana Fuels partners with non-profit organizations that serve the needs of the community by donating a portion of each purchase from every gallon of gasoline sold. During an award presentation at MEO’s headquarters, CEO Lyn McNeff said, “We are grateful to HFN Maui Petroleum, Ohana Fuels for their support. They are wonderful community partners. This funding will allow us to assist clients who may otherwise be turned away. Grants are typically specific, dictating who qualifies and receives assistance. If the individual does not meet the funding source’s eligibility criteria, we can’t help. These funds will allow us to help the “gap” group who are in serious need of assistance. It will also be used to help support other unfunded agency needs. Ohana Fuels has four locations on the island of Maui. Ohana Fuels gasoline has been certified as TOP TIER™ to meet the premier standard of gasoline for optimum performance and fuel efficiency recognized by six of the world’s top automakers, BMW, General Motors, Honda, Toyota, Volkswagen and Audi. TOP TIER™ additives help clean your engine; optimize fuel economy; eliminate hesitation, stalling, and rough idling; restore optimum performance; and reduce emissions. MEO is a non-profit Community Action Agency incorporated on March 22, 1965 under the Economic Opportunity Act of 1964. Its mission is to strengthen the community while helping people in need, restore their hope, reach their potential and enrich their lives. Last year MEO served over 23,000 individuals and touched more than 71,000 lives. For more information about MEO contact CEO Lyn McNeff at 249-2990.